Whether you’re just starting out using essential oils or you’ve been around for awhile, you may have (and should have) heard that it is a good idea to dilute your oils. Sometimes people will even say to “heavily dilute” your oils. What exactly does this mean and why would you want to dilute? Reduce chance of sensitization: Sensitization occurs when a person is overexposed to a particular substance. This may start out with a simple rash and can progress into life-threatening anaphylaxis (a full-body reaction that makes breathing difficult and can lead to death). While this could happen at the first exposure to a substance, it most likely occurs over time with prolonged and/or overexposure. Using essential oils neat (undiluted) greatly increases this risk. Reduce chance of irritant contact dermatitis (ICD): ICD is a localized reaction to a particular substance. The affected area may become red or inflamed, itchy, discolored or blistered. This is more likely to occur when the highly concentrated essential oil is used neat (undiluted). Save Money: Let’s face it: essential oils are expensive! Diluting oils saves you money. Carrier oils tend to be much less expensive than essential oils. Consider that 4 oz of jojoba oil could cost as much as $20, while the same $20 will get you less than 1 oz of lavender essential oil. Save even more money by using even less expensive carrier oils such as olive oil or fractionated coconut oil. 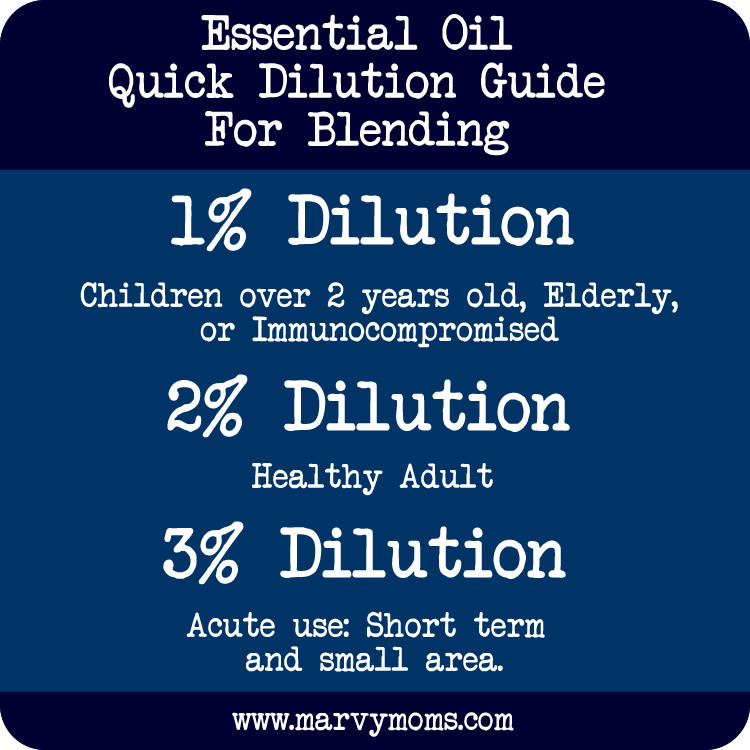 Dilution is an important thing to understand when creating blends with essential oils. There are several factors to consider, however there are some basic guidelines that are a great place to start. 3% Acute use: Short term and small area. Please keep in mind that the above quick dilution guide is an extremely simplified guide to figuring out how much essential oils to include in your blends. If you are considering using a blend that falls outside of these basic parameters, I recommend that you find a qualified aromatherapist to help you to figure out the best blend for your individual circumstance. Okay, so now you know that you should dilute and even how much to dilute, but how in the world do you figure out how many drops to use to get the desired dilution? I’ve created some calculators to help you to figure out just that. I was tired of trying to do the math every time and wanted something that would just do it for me. I decided to create something that I can go back to again and again and am sharing it here with you. This is going to forever change how you use essential oils by making it easy to get dilutions just right! Bookmark this page and come back whenever you need to figure out how many drops to put into your blend. You can also use this page to find out what the dilution percentage is for a recipe you found somewhere. If the dilution of a recipe is too high, you can use these calculators to get it back down to a safe level. Use this calculator to figure out how many drops of essential oil to add to your blend. Calculations are a rough estimate based upon the premise that there are 20 drops in 1 ml, however, number of drops per ml may vary in practice. The only way to get an exact measurement is to weigh your blend on a scale. This calculator will give you a starting point for intentionally blending at a safe dilution. Answer the questions below to get started! 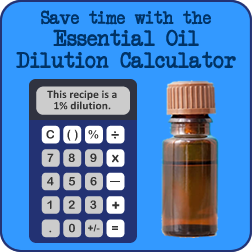 Use this calculator to figure out the dilution of a recipe you have for an essential oil blend. Calculations are a rough estimate based upon the premise that there are 20 drops in 1 ml, however, number of drops per ml may vary in practice. The only way to get an exact measurement is to weigh your blend on a scale. This calculator will give you a starting point for intentionally blending at a safe dilution. Number must be between 1 and 100. Add drops of essential oil to your container and top with carrier. This recipe is a % dilution. What do you think? Will this help you with figuring out dilutions for your blends? If you have any suggestions for another calculator, I’d love to hear about it! While we’re talking about essential oils, did you know that I’ve interviewed over 20 essential oil companies? Find out what companies I’ve already posted and sign up to have Marvy Moms updates sent to your inbox to be sure you see all the essential oil company profiles as I post them! Explore all essential oils articles, including Safety First with Essential Oils and How To Choose an Essential Oil Brand. So smart!! Love that calculator! Glad you like it, Penny! I’m so tired of seeing unsafe recommendations (by EVERYONE), so I was so happy to see this post! Thank you for posting this, maybe those people will gain some knowledge and realize how reckless they’ve been. I make an herbal salve for my family (“owie cream”) and the base is certain herbs steeped in an oil mixture, and then beeswax added. Most of the time, it alone is effective, but sometimes I do add lavender and tea tree eo for certain uses, and I always label with dilution. Some people have asked for my magical cream and I’ll ask who/what they plan to use it for and note that I have different strengths. They look at me like “uh…does it matter?” Most people don’t understand that more does not mean better. Would love to see this in an app. Me too!! An app would be great! I agree!! Make this into an app! This is awesome! I will still calculate on my own because I need to know how to do it. I’m going to school to become registered aromatherapist. But my at home work, I will def. Be using this to double check. Make sure I’m right! Thank you! Hey….just bumped into this. I am very interested in studying aromatherapy but we don’t have such schools around where l am. Which good schools offer online courses on the same that l could benefit from? Kindly let me know. Hi! I stumbled upon your website! I’m I love! I have a question though? I love the smell of a campfire burning and I want to recreate it with essential oils. Can this be done? Thank you for all this valuable information. I am a newbie when it comes to my oils. I have only diffused since I didn’t understand about dilution. With summer upon us I am eager to try bug spray, mosquito repellent, and some cleaning solutions just to name a few. My main priority has always been safety first. I feel a lot more confident now that I can dilute properly! I must comment for you, I’ve been using your calculator almost daily through the holiday season. Great resource! Glad to hear your finding it useful, Shelsea! I know this is not the right spot to put this but I have a friend that was diagnosed with pancreatic cancer. I’ve read what oils are good for that not that it will cure him but will help I just do the know the best way for him to use them and how much this man happens to be our family doctor as well he saved my husband life I would just like to make it a little less painful for him if it can’t get rid of it altogether. A lot of prayer going out for him just want to take an extra step. It’s wonderful that you want to help your friend. I would suggest having him contact an aromatherapist to help select essential oils that might make him more comfortable and a naturopath that specializes in working with people with cancer. Remember that even with the best intentions, that he can only receive help that he’s willing to follow through with. He is likely getting information from all different directions and will make choices that only he can decide. It’s okay to let him know about some options and then pray that he finds the best path for himself. This calculator is the best! Thanks for sharing! There are about 5 ml in 1 teaspoon and 15 ml in 1 Tablespoon (3 tsp in 1 Tbsp). This is a rough calculation that should help with blending. So happy to find your site. Im newbie on EO, this would help alot with my plans of making topical cream and eo spray. Thanks very much. Had to jump out of bed tonight and make a quick blend for some digestive issues… and it’s late, and my brain was not thinking clearly enough to make these simple calculations on my own. I KNEW there had to be a place out here in cyberspace that would perform this step for me. I found plenty of them that would solve the equation, but only for larger amounts. Then, I found this. Thank you SO MUCH, Emily, for creating the most useful EO blending tool since the dropper!!! Now, to get the booming world of essential oil users to understand the need for this, and for safety!!!! !